Radio is enjoying a bit of a renaissance. What was once a highly localized industry some feared would fade into obsolescence is not just surviving, but thriving. Satellite radio subscription services are on the rise; Sirius XM’s profits last year topped $4.6 billion. However, according to the Pew Research Center’s 2015 report, a staggering 91 percent of people over the age of 12 still listen to “terrestrial” (as opposed to online) radio at least once a week. 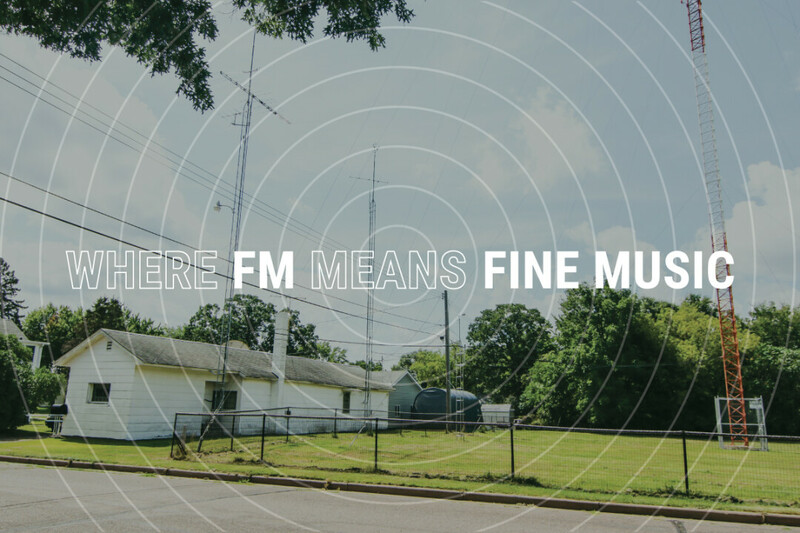 Now with apps like TuneIn, you can listen to a beloved station even when you’re not in range of the signal, enabling radio to roar back in urban markets where a majority of listeners do not own cars. Of course, here in the Chippewa Valley, most of us do own cars and still listen to radio “the old-fashioned way.” And while we have corporate behemoths like iHeartRadio’s Z100 represented on the dial, we also have something very, very unique: an independent, family-owned station that has, against all odds, managed to stay on the air for nearly 50 years: WCFW-FM (105.7), “where FM means fine music,” as the catchy jingle goes. I’ll never forget the moment I first stumbled upon the oddball frequency – I had just moved to Eau Claire and was in my car scanning through local stations when I landed on a Rosemary Clooney ballad, one of my mother’s favorites. It was a breath of fresh air after skipping past all the classic rock, country, and Iggy Azalea – suddenly I was transported to a different time. I assumed I had tuned in to an oldies station, except that the next song was George Michael’s ’90s hit “Careless Whisper.” As I continued to listen, I became increasingly bemused and intrigued. Who was masterminding this playlist? Whose eclectic taste in music included both Dion and the Belmonts, Phil Collins, Linda Ronstadt, and the Backstreet Boys? The answer: Pat and Roland Bushland, who have owned and operated WCFW since 1968. Officially, the genre they play is adult contemporary (“the best light hits in the Valley”), also known in the industry as “middle-of-the-road” music. But it’s a pretty liberal definition of contemporary given that it encompasses artists like Frank Sinatra and Gloria Estefan. 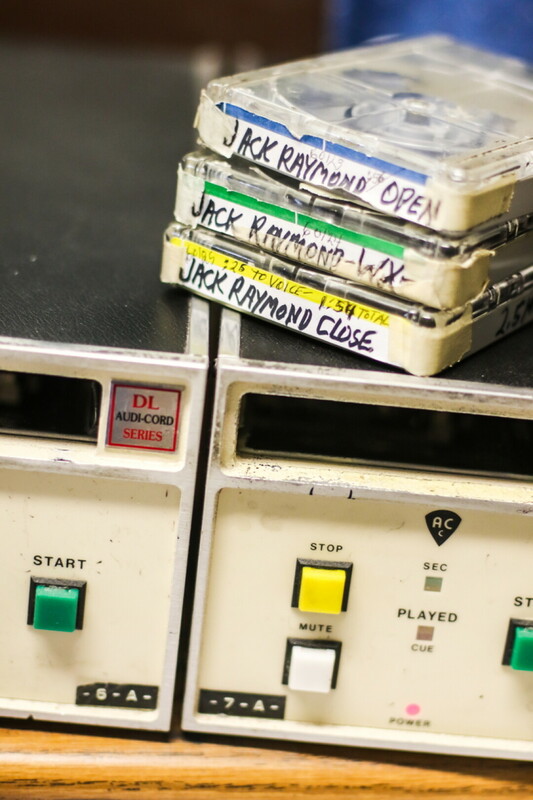 And there are other curiosities – pre-recorded relics from the Golden Age of Radio, such as The Jack Raymond Show and Science Report – but more on those in a moment. The history of the station is as unusual and quirky as the programming, and no one, not even the Bushlands, imagined they would be on the air for as long as they have. 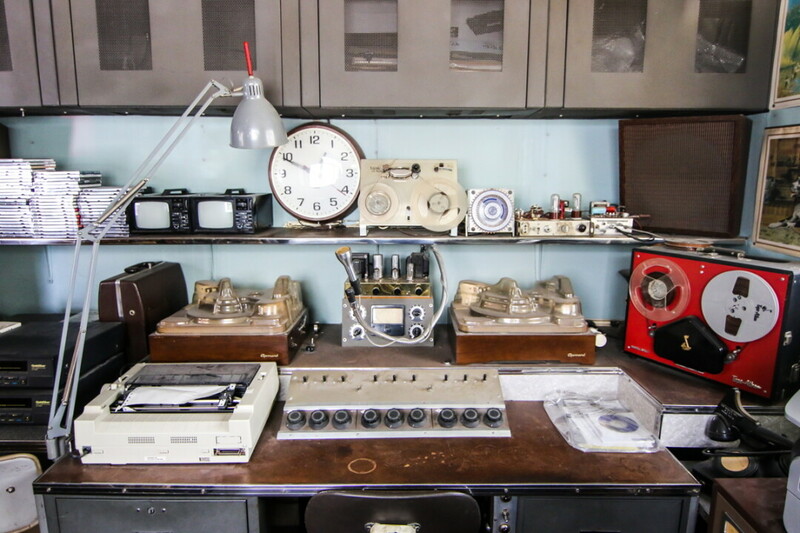 The story begins back in 1932, when Roland’s father, Roy, opened Bushland Radio Specialties in Chippewa Falls, selling wholesale radio parts and doing repairs. Roland, or Rollie as most know him, took an interest and began learning about the engineering side of the business. In 1952, Rollie began working with his father full time, and in 1958 they moved to their current location on Loring Street in Eau Claire. 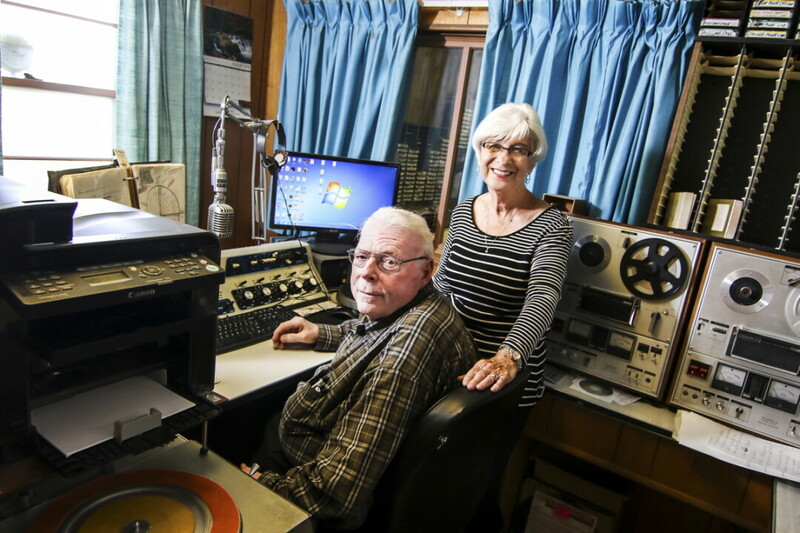 Pat and Rollie married in 1960 and started a family; eight years and three daughters later, Rollie’s dream of starting his own station came to fruition. On Sunday, Oct. 20, 1968 (Pat’s 29th birthday), after receiving a telegram from the FCC the afternoon before, WCFW went live, transmitting from a modest radio tower built by Rollie himself. At first, they broadcast daily from 7am to 11pm, but now they are on the air 24 hours a day, and commercial-free from 11pm to 6am. Due to the dominance of AM radio in the late ’60s, “All the other stations in town gave us a year,” Rollie says. 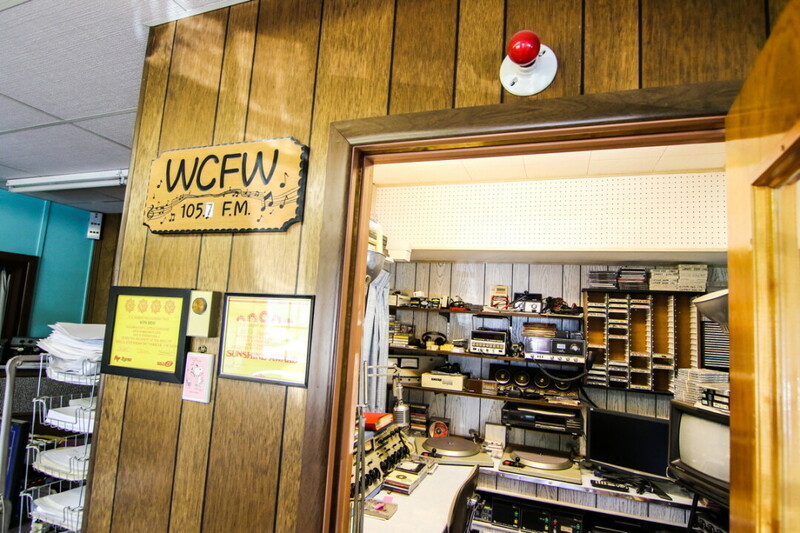 WCFW was one of only five FM stations in the region at the time, and many thought FM wouldn’t last very long. Initially, their signal was only 3,000 watts, reaching a 35-mile radius around Chippewa Falls, and everything was played off of vinyl. In the ’90s, they increased their power to 25,000 watts and the listening area grew substantially. Now WCFW uses an automated system to play songs, and there are about a thousand in rotation. But the turntables are still there, and occasionally, if the system goes down due to a severe storm, they get some action. “We always have a record ready just in case,” says Rollie with a smile. When I asked Rollie how the station has changed since 1968, his answer was, “It hasn’t.” And that’s essentially true – they still play polka in the early morning hours, which, according to letters they receive from grateful dairy farmers, helps relax the milking cows. When I asked Rollie how the station has changed since 1968, his answer was, “It hasn’t.” And that’s essentially true – they still play polka in the early morning hours, which, according to letters they receive from grateful dairy farmers, helps relax the milking cows. And they still try to minimize the talk, only taking a break for news (the Associated Press syndicated news service) at the top of each hour. In terms of ads, you won’t hear many – no more than two or three at a time, and mostly from longtime Chippewa Falls businesses, such as Christensen Florist & Greenhouses and Korgers Furniture and Decorating. Pat, who describes herself as a “people person,” handles the ad sales, and says it’s the personal relationships she has cultivated over the years that she enjoys most about working in radio. WCFW’s format works, so why change it? They are a respectable third in the ratings share for adults over 45. They are less competitive with younger listeners, but that doesn’t appear to be their target demographic anyway, given that they have no plans to develop their presence on the web or promote via social media. But the real secret to their success lies in their ability to offer things no other station can, like live coverage of Chippewa Valley high school football and basketball games with play-by-play commentary by professional sportscaster Hayes Callaghan, formerly of WQOW. They are also the only station in the country still airing a two-minute educational segment called Science Report, a defunct project of the American Institute of Physics. Science Report comes on three times a day on the weekends, and features a scientist explaining, well, something scientific (like how solar panels function or why sound waves can’t travel in outer space). Best of all, WCFW is the only place where you can hear the melodious voice of Milwaukee-based radio personality Jack Raymond. Raymond, who was born Jack Thomas Raymond Besendorfer, is the subject of a documentary that premiered at this year’s Eaux Claires festival. The film, Silently Steal Away, was conceived and directed by UW-Eau Claire alum Andrew Swant, who plans to submit it to film festivals in the coming months. Uncovering information about Raymond’s life and career proved no easy task; as Swant explained, “There’s virtually nothing online about Jack Raymond, it’s like he never existed.” The Bushlands claim that someone connected to Raymond’s widow supplies the episodes of the hour-long Jack Raymond Show, which WCFW airs twice daily, at noon and 11pm. Every six months to a year, a new batch of tapes arrives and the Bushlands mail back the boxes of recently played tapes, but Rollie declined to disclose how this system came about (or who exactly is overseeing the transfer on the other end). He did, however, confirm that the approximately 700 tapes in circulation are the original recordings, not duplicates. Rollie only met Raymond, whom he described as “laid-back,” once in person, sometime in 1970 when Raymond was traveling around Wisconsin selling his show to local stations. To help fill in some of the blanks for this article, Rollie gave me a grainy Xerox of a newspaper clipping from 1954 titled “Jack Raymond a Solid Hit in 11 Years at WISN.” The article notes that Raymond, known for “his sophisticated taste in poetry and music,” began his radio career in Chicago, but returned to his hometown of Milwaukee in 1943 and joined the staff of WISN. He hosted a popular late-night program called Worth Listening To, during which he played instrumentals and always signed off by reading a poem. What follows this greeting is an hour of what Raymond describes as “music, a bit of song, and perhaps a word or two.” During each show, he plays a mixture of big band instrumentals, Broadway show tunes, and ballads by crooners like Billy Vaughn and Johnny Mathis. In between, he offers wry witticisms; some are dated and borderline offensive (“One of the things women say is hard to adjust to after being married is being whistled for instead of whistled at”), some are eerily timeless (“America unquestionably has the highest standard of living – in fact, most of us can’t afford it”), and some are just silly (“Show me a man who stands on his own two feet, and I’ll show you a man who’s had his car repossessed”). Clearly Raymond had a healthy sense of humor, and his voice radiates charm and warmth. I also detect a trace of mischief in his tone, which his colorful past supports. While researching his film, Swant discovered that as a young man Raymond ran away from seminary, stole a car, spent time in a mental hospital, and at one point was engaged to four different women at the same time. Raymond died of a heart attack in 1975, but he still gets mail at WCFW; Rollie showed me a letter addressed to “Mr. Jack Raymond” that he received a month ago from an 85-year-old man in Altoona. Pat Bushland speaks warmly of their “loyal listenership” and I imagine The Jack Raymond Show has a lot to do with that. What a pleasure it must be for older generations to be able to hear the music they grew up with – and for younger fans like me, the show offers a brief but fascinating glimpse into the history of American popular music. 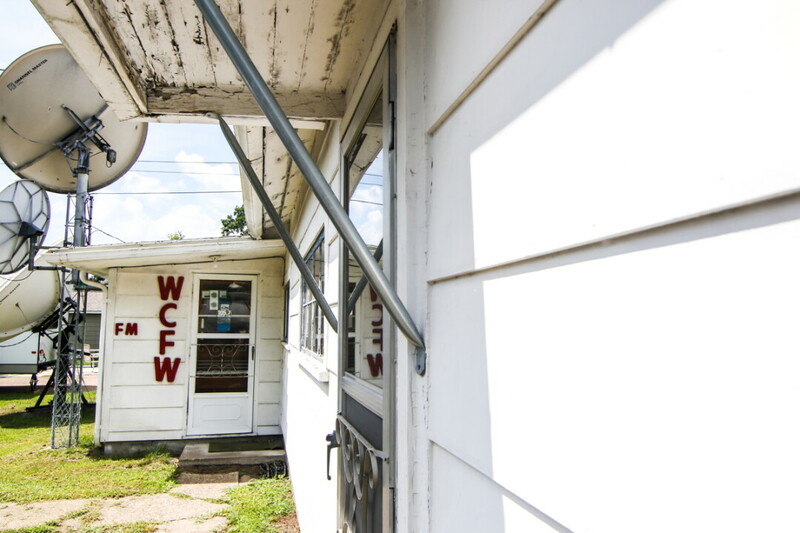 As for the future of WCFW, there may be someone to carry on the tradition when the Bushlands retire – Pat and Rollie’s grandson Parker Reed is a journalism major at UW-Eau Claire and serves as president of WUEC-FM 89.7, the campus radio station. 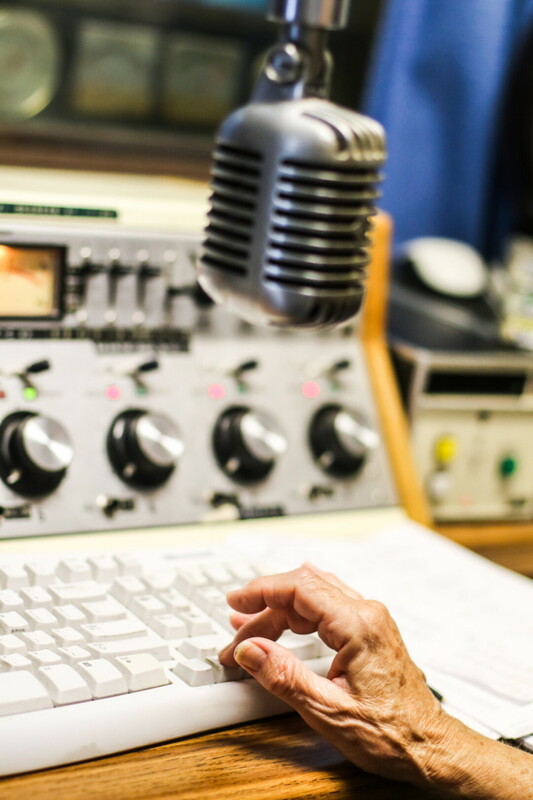 So it seems radio might run in the family, which is good news for all of us here in the Chippewa Valley who hope to still be tuning in for another 50 years.